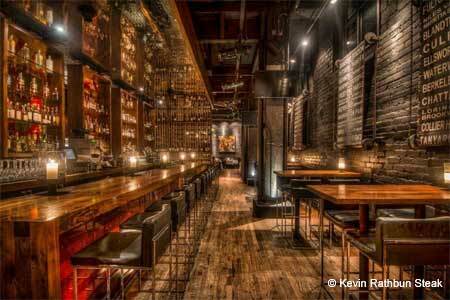 An old industrial building comes alive with Kevin Rathbun’s characteristic ebullient atmosphere and great steaks. : Finding a 100-year-old Lea & Perrins Steak Sauce bottle, authenticated by the raised letters and the JDS on the bottom, referencing its first U.S. importer, John Duncan, was just one of the lucky strokes that preceded the opening of Kevin Rathbun Steak. Revived and renovated, the early twentieth-century building retains its old touches, such as its textured brick walls. Sourced from Chicago's Allen Brothers, the dry-aged steak, of course, is the name of the game, and these come very large indeed---with price tags to match. Smaller six-ounce and ten-ouncers also are available, however, at more modest prices, and are plenty for most people. For the red-meat averse, there is a good pork chop entrée and a wide selection of shellfish and fish. Vegetarians will do well here, as there are plenty of sides, and the crispy fried okra and mac 'n' cheese are both topnotch. Anyone with room for dessert after polishing off a steak will be well rewarded. The wine list focuses on red selections, of course, with most whites falling into the Chardonnay department, a bit of a disappointment. A few "other white" wines also are available. Noise levels are pretty high, so an early reservation might prove worthwhile.